On January 30th some members of the Working Committee Vasculitis met at Hamburg's "Chamber of Commerce", to set up a stall at which we wanted to inform participants of the 129th Annual Conference of North-West-German Society for Inner Medicine on our activities. We were warmly welcomed by the leading organiser, Mrs. Fischer . When she showed us the place she had chosen for our stall all our hearts leaped up; we were not supposed to stand somewhere in a hidden place among the stalls of the pharmacy-exhibition, which took place at the same time, but were situated next to the entrance to the room where the lectures were to take place; everybody would have to pass us. While we were allowed to remain idle somebody brought a table and some chairs and a presentation-board was put up.Our job was to turn the empty spaces on it into something interesting to catch the eyes of passers-by. The following morning Mrs. Ruehmann and Mrs. Naujoks appeared to take care of the stall. 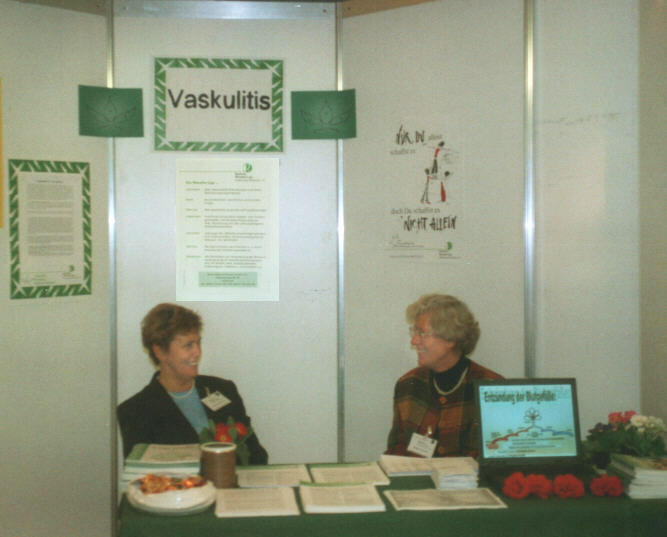 We were hoping that doctors might stop to have a look at the leaflets with information on vasculitis in general, on the Schleswig-Holstein Rheumatic-League and about our own internet-site, and they did. Now and again our big bowl of candies attracted doctors who had arrived with an empty stomach. Many interesting conversations were conducted. Some doctors from the famous Bad Bramstedt hospital came along to shake hands with us (for example Prof. Gross, Dr. Reinhold-Keller, Dr. Wagner-Bastmeyer). Mrs. Fabel from the German Rheumatic-League introduced herself. When we returned home in the late afternoon we were deeply satisfied; we had handed out many of our informative flyers and had had very informative talks, our bowl of candy was empty! We were hoping that our work would not come to naught. Some days later our expectations came true: the number of visitors on our website had increased incredibly. We have to give credit to many helping hands for making this day such a success: our webmastress Birgit Wiedenmann-Naujoks, who is also the creator of our flyer, had developed an online-presentation and provided many helpful ideas to make our stall look well. Mrs. Ruehmann's daughter had lent us her personal laptop-computer without which our eye-catching presentation would not have been possible. The Schleswig-Holstein Rheuma-Ligue reimbursed our costs and provided informative papers. We thank especially Mrs. Fischer from " Kongress- und Messebüro Lentzsch" from Bad Homburg, who had chosen this special place for our stall. This day in Hamburg's Chamber of Commerce has encouraged our "Support Group Vaskulitis" to participate in other events a s well. Thus we will have the chance to spread knowledge about the still rarely known illness vasculitis and we might be able to find "multipliers" spreading it.